Editor’s Note: This is a guest post from Matt Moore, author of the cookbook: Have Her Over for Dinner. Ever since man created fire, we have been searching for new and better ways to prepare food. With regards to culinary evolution, our society has come quite a long way since the early days of roasting raw meat over open flames. 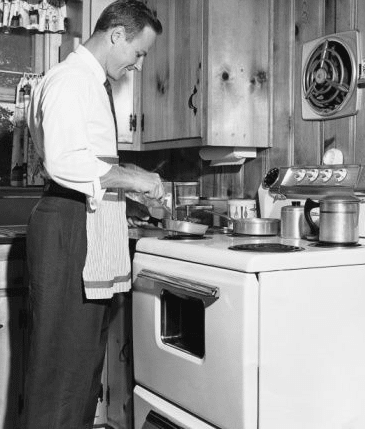 Yet somewhere along the way, men lost their place and confidence in the kitchen. Blame it on progress, or blame it on convenience, the fact remains; most men cannot cook. Sure, we might stand guard over the grill on Labor Day weekend or have a few ‘signature dishes’ up our sleeves, but collectively, our overall culinary knowledge and skills are limited. Even with the advent of ‘food television’ and popular shows like Top Chef, our interest in food is more focused around entertainment rather than on expertise. To be brutally honest, most of us were raised by a generation where cooking was not a central activity in our household, and if it was, it wasn’t done by the man of the house. Beginning in the late 1950’s through today, modern conveniences drastically reduced the need to possess culinary skills. The long lost sound of the dinner bell has been replaced by the sound of kids slamming car doors to meet Daddy at the neighborhood chain restaurant. In my experience, there is still one element that can get men back into the kitchen: women. Put simply, women love a man who can cook. There might be a few women that don’t like the idea of a man cooking for them, but I’ve yet to meet them. If you are looking to impress a date, avoid over-priced restaurants and stand out amongst the crowd . . . have her over for a dinner date at home. Before you start taking reservations at your dining room table, I must confess: I am not, nor do I pretend to be a chef. Over the years I’ve listened to the needs and wants of regular guys when it comes to food. The underlying sentiment is always the same. “Give me clear, easy recipes that feature ingredients that I can buy anywhere.” My culinary approach is based on using simple preparation to turn quality ingredients into outstanding meals. One of the greatest traits of the male persona is our affinity for taking things to the extreme. Whether it’s our career goals, a workout plan, or that fully restored ‘69’ Chevelle that’s sitting in the garage, we always shoot for the max. This trait however can cause trouble in the kitchen. We tend to live by the “more is better” approach to cooking. If we’ve ever heard or seen an ingredient used in a particular dish, you can bet the house we will find a way to incorporate it in some form or another. I’m not here to criticize, but a salmon fillet doused in soy, mustard, lime, chipotle, garlic, and oil just seems like overkill, if not a bad combination. Instead of investing countless dollars into marinades and seasonings, stick to fresh, quality ingredients. After all, great ingredients speak for themselves. With that concept in mind, I’m here to encourage you to embrace your roots and get back into the fire (kitchen). You don’t need expensive equipment or a grocery list of ingredients to create exceptional meals. The kitchen should be a place where you can demonstrate your sense of confidence, precision, and preparation to that lovely lady. I’ve laid out three meals that put the control in your hands. You decide what works best based on your schedule. In the past, I’ve found that most guys struggle when trying to put together an entire meal. In light of that struggle, I’ve offered up an array of ideas for appetizers, salads, and desserts to go along nicely with each entrée. I’ve also given you a few thoughts on pairing a particular wine or beer with the meal. Just remember; keep things simple, relax, and let the compliments (and her admiration) start rolling in. White Bean Crostini – Quick and easy, these work great served either hot or at room temperature. If you need a shortcut, check out the bakery section in your grocery store for toasted French bread slices. Preheat oven to 400 degrees F. Lay out bread slices on a baking sheet and brush with olive oil and season with fresh cracked pepper. Place pan in the oven and bake, 7-8 minutes, or until edges are golden brown. Meanwhile, combine remaining olive oil with the next four ingredients into a food processor and process until mixture is smooth. (If not using a food processor, use a mortar/pestle, or simply combine items by placing in a bowl and mashing with the backside of a large spoon or masher for a more rustic consistency). Remove toasts from oven and spread with a thin layer of the bean mixture, followed by a light sprinkle of cheese. Serve. Pan Seared Salmon with Roasted Potatoes and Asparagus – Fresh, simple, and clean. Pair with a California Chardonnay, an Oregon Pinot Noir, or a light Lager of your choice. Preheat oven to 400 degrees F. In a large baking dish, season potatoes with salt, pepper, ½ cup of olive oil, rosemary, and the juice from ½ lemon. Place potatoes in the oven and roast until fork tender, about 40-45 minutes. Next, lay out asparagus in a single layer on a baking sheet; drizzle with 2 tablespoons of oil, season with salt and pepper, and toss to coat each spear. In the last 15 minutes of cooking the potatoes, preheat a cast iron skillet over medium heat and season salmon filets with kosher salt and fresh cracked pepper. Add asparagus to oven and roast for 8-10 minutes. Meanwhile, add 2 tablespoons of oil to the skillet followed by the salmon filets; cook, undisturbed, for 3-4 minutes. Squeeze the juice of remaining ½ lemon over the top the filets; flip. Cook filets for 2-3 more minutes, or until internal temperature reaches 135 degrees F; remove from heat. Plate potatoes in the center of the plate, and rest the salmon filets and asparagus at each opposing side. Serve. Tomato, Red Onion, Cucumber, and Feta Salad – This “salad” works great because it can be prepared in advance and left in the refrigerator while you complete the rest of the meal. Allowing this dish to ‘sit’ will also allow the flavors to meld together; however, don’t let it go for more than two hours, as the vegetables will lose some of their crispness and become soggy. In a serving bowl, combine tomatoes, red onion, cucumber, and feta cheese. In a mixing bowl, combine the remaining ingredients and whisk thoroughly until well combined, or emulsified. Pour dressing into the serving bowl with the other ingredients and toss well to coat. Cover with plastic wrap and place in the refrigerator until ready to serve, keeping up to two hours. Pork Chops with Black-Eyed Pea Risotto and Sautéed Spinach – There’s a lot going on in this Southern meets Italian eclectic dish. Make sure you read through the entire recipe and sequence before you get started. Caramelize the onions, then concentrate on the risotto (it takes constant attention), and finally finish things off with the pork chop and spinach. This is comfort food at its finest. Pair with Pinot Noir, Amber or Pale Ales. At least one hour before cooking, add ¼ cup of oil, balsamic vinegar, and garlic into a large Ziploc® bag. Season chops with salt and pepper and add to bag. Marinate up to one day in advance, keeping in refrigerator. Add 2 tablespoons of oil to a preheated skillet over medium-low heat. Add onion slices into the skillet and cook slowly, stirring on occasion, for 20-25 minutes until tender and caramelized; remove onions from skillet and set aside on a plate. Meanwhile, in a separate pot over medium low heat, add chicken broth to heat through. Next, add the last 2 tablespoons of olive oil into a new skillet over medium high heat. Add rice into the skillet and stir to coat the grains in oil. Toast rice, stirring on occasion, for 2-3 minutes until the grains begin to become opaque. Add 1 cup of broth to the toasted rice and bring to a simmer for 1-2 minutes. Reduce heat to medium, and stir constantly, adding 1 cup of broth at a time as the rice begins to absorb all of the liquid (Note: All of the broth may not be used). Continue in this manner until mixture becomes slightly firm, yet still creamy (30-35 minutes); add the black eyed peas into the mixture to heat through. In the last 10 minutes of cooking the risotto, reheat the skillet used for the onions over medium high. Remove the chops from the bag and shake off the excess marinade. Add chops to the skillet and cook, undisturbed for 3-4 minutes, flip and cook for another 5-7 minutes, or until internal temperature reaches 150 degrees F; set aside to rest. Next, add ¼ cup of remaining broth (or water) into the same skillet to deglaze the pan, scraping up any of the browned bits from the chops and onions. Immediately add spinach into the skillet and cook for 1-2 minutes until the spinach is wilted; add onions back into the skillet to heat through. Begin plating by placing a generous serving of risotto in the center of the plate. Next, top the risotto with a bed of the onion/spinach mixture and finally rest the pork chop on top. Serve immediately. Baked Apple Crisp a la mode – This dish is quick and super simple. If preparing in advance, keep the apples from browning by adding a spray of lemon juice over the cut flesh. Pop this in the oven as you serve dinner and it will be ready just in time. Preheat oven to 375 degrees F. Wash and dry apples, slice in half, and remove core and seeds using a spoon or knife. In a baking dish, carefully arrange apples flesh side up. Sprinkle evenly with brown sugar and cinnamon and top each half with 1 tablespoon of butter. Bake until apples are tender and bubbly, about 30-35 minutes. Remove apples from baking dish and plate 2 halves in each serving bowl. Drizzle any remaining butter or juices over the top followed by a sprinkle of granola. Serve with vanilla ice cream on the side. Sautéed Shrimp Cocktail – A play on the traditional shrimp cocktail by sautéing the shrimp and serving while still warm. The warm shrimp with the cool cocktail sauce makes for a nice contrast. In a small mixing bowl, combine ketchup, horseradish, and the juice from ½ lemon, mix until well combined, cover and place in the fridge. Next, preheat a large skillet over medium-high heat, add oil and red pepper flakes; sauté for 30 seconds. Add shrimp, garlic, and salt; sauté for 2-3 minutes. Add the juice of remaining ½ lemon and continue to sauté until shrimp are firm and bright pink, 1-2 minutes. On serving plate, add a generous portion of the cocktail sauce in the center of the plate. Arrange shrimp around the perimeter of the plate and garnish with chopped parsley. Serve. Spinach Salad with Blue Cheese and Pancetta – Pancetta can be found in the deli section of most grocery stores. It has a flavor profile similar to that of bacon. I like using pancetta because you can buy just what you need, and nothing goes to waste. Heat a cast iron skillet over medium heat. Add pancetta and cook until crispy and fat has rendered, turning once, 5-6 minutes. Remove pancetta from heat and place on paper towels to drain excess fat and cool. In a separate mixing bowl, add vinegar, olive oil, salt, and pepper and whisk until incorporated. In a serving bowl, toss dressing with spinach leaves and red onion. Garnish with pancetta, gently broken by hand, and top with crumbled blue cheese. Serve. Grilled New York Strip Steaks with Garlic Butter and Yukon Smashed Potatoes – Be sure to splurge on some quality steaks on this one. A local butcher or an organic grocer will probably have the best selection. Serve with Cabernet Sauvignon, Syrah, Merlot, Amber Ale, or Porter. Preheat grill over medium high heat. In a small mixing bowl, combine two tablespoons of butter with the minced garlic and chopped parsley; mix until incorporated and place in the refrigerator to set. Next, heat a large pot of water over medium high heat. When water comes to a boil, add potatoes and boil 11-13 minutes, or until fork tender; remove from heat and set aside. Liberally season both steaks with salt and pepper on both sides and add to the grill over direct heat. Cover and cook, undisturbed for 2-3 minutes, then turn the steaks at a 45 degree angle and cook for another 2 minutes. Flip steaks and move to indirect heat until internal temperature is 135 degrees F for medium rare/medium, about 3-4 more minutes depending on the cut; remove from grill and set aside to rest. Meanwhile drain potatoes, allowing the steam to evaporate. Add potatoes back into the same pot with the remaining 6 tablespoons of butter and cream. Using a potato masher, mix and mash until all of the ingredients are incorporated and mixture is smooth without large lumps. Season potatoes with salt and pepper to taste. Plate a generous portion of potatoes in the center of the plate and rest the steak at one side. Add about a tablespoon of the garlic butter on top of each steak and garnish dish with any remaining chopped parsley. Serve. Grilled Peaches with Ricotta and Honey – Another simple dessert with great flavors. Keep the grill on low after cooking the steak to cook off and clean the grate. The peaches can be prepped in advance to have this dessert turned around quickly after dinner. In a small microwave safe mixing bowl, combine butter, brown sugar, and cinnamon. Place the bowl in the microwave for 30 seconds on high, mix well. Carefully cut all the way around the side of the peach and twist to remove the pit, using a spoon to dig out the pit if needed. On a lightly greased grill over medium high heat, place the peach halves cut side down and cook for 3-4 minutes over direct heat. Turn over peaches, generously spread with the sugar and cinnamon mixture, and move to indirect heat; cover and cook, 10-12 minutes. Remove peaches from grill and serve on individual small plates. Top each with a tablespoon of ricotta cheese and a drizzle of honey. Garnish with mint leaves and serve. For more recipes that will win over your date, check out Matt’s book: Have Her Over for Dinner. What are your go-to meal ideas for impressing a date? Share your recipes and ideas with us in the comments!